This cable guide / pulley may work better than the one described there, because it puts the cable a bit closer to the original location. 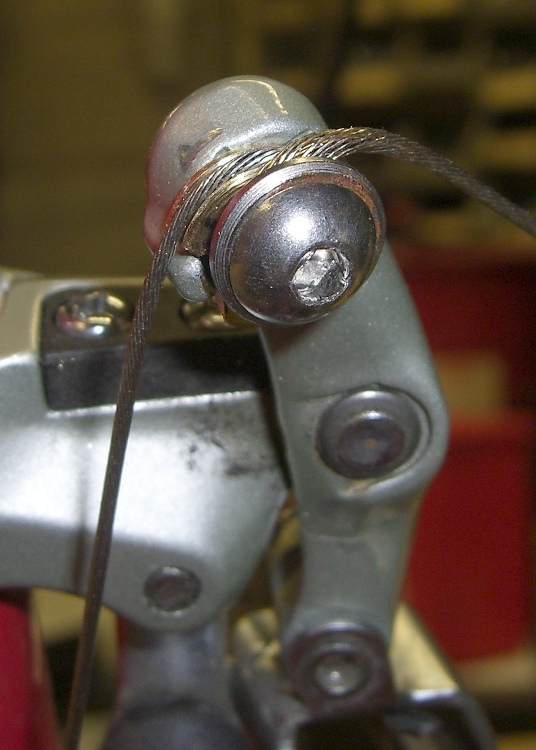 To recap, the problem is that the cable bends around the small finger at about 8 o’clock on the derailleur arm. After a few zillion shifts, the concentration of stress at that point breaks the cable, strand by strand, until it snaps at the most inconvenient moment. 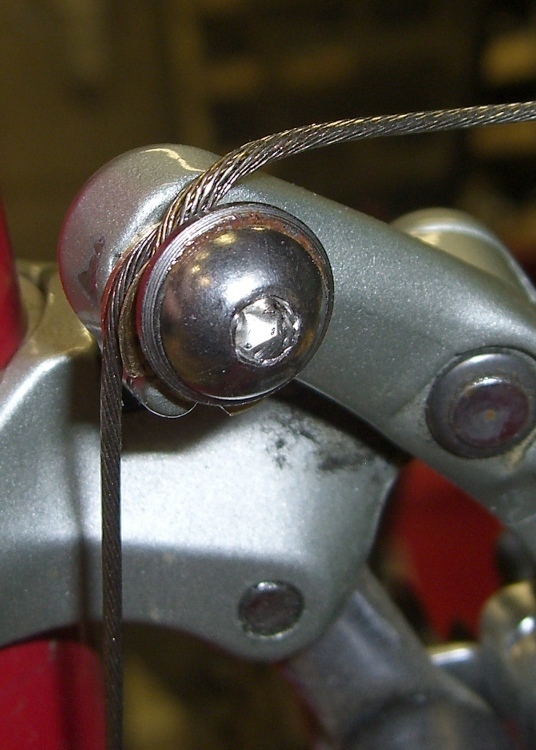 The small brass disk (about 0.43″ dia) has a groove machined around the perimeter that’s roughly the size of the shifter cable. The hole (Number 8 or 9 drill) is a slip fit for the 5 mm bolts, but it’s off-center enough that the cable passes roughly where it would without the disk. A notch in the side of the disk rests on the finger, guiding the cable over the finger without (I hope) bending it at that point. The cable just wraps around the screw under the original stainless-steel washer, which pretty much crushes the poor thing flat. Here’s another look with the derailleur pretty much over the large chainring. You can see the disk and groove in action. This was another quick-and-dirty lathe project, with everything done to eyeballometric accuracy. If it works better than the previous half-assed effort, I might actually get around to making a third one and recording the dimensions.